The next total solar eclipse visible from the continental United States occurs August 21, 2017. It’s likely to be the most-viewed ever, so the time to start planning where you will be on that date is now. This will be the first such event to cross our country in 38 years. Great weather should abound along the path. The dark part of the Moon’s shadow first touches land in Oregon, crosses 11 more states, and ends in South Carolina before heading into the Atlantic Ocean. Front Page Science will be conducting a huge public observing event at Rosecrans Memorial Airport in St. Joseph, Missouri. 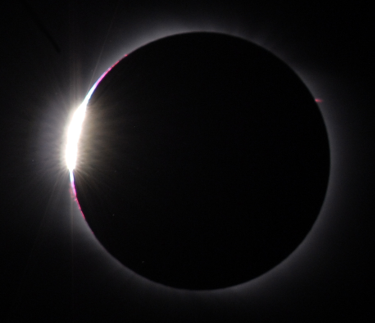 From there, you can experience 2 minutes and 39 seconds of totality, only 1 second short of the maximum time possible. We’ll have astronomers on hand to explain what’s happening and lots of safely filtered telescopes you can view through. And it’s FREE! Join us for one of the greatest public observing events in history. You’ll remember it for the rest of your life. See our event’s new poster designed by Tyler Nordgren. Added “Elsewhere” to the top menu. Click it to see other eclipse-related events across the U.S. The Astronomical Society of Kansas City has become a partner of our eclipse event. Excellent! This website has a new name: StJosephEclipse.com. Clearer. Easier to understand. Easier to search online. Celestron has become a partner of our eclipse event, and we truly thank everyone there for the support. © 2014 Front Page Science, LLC. All rights reserved.